Big Bubble Dive - Scuba Diving In Gili Trawangan, Indonesia. 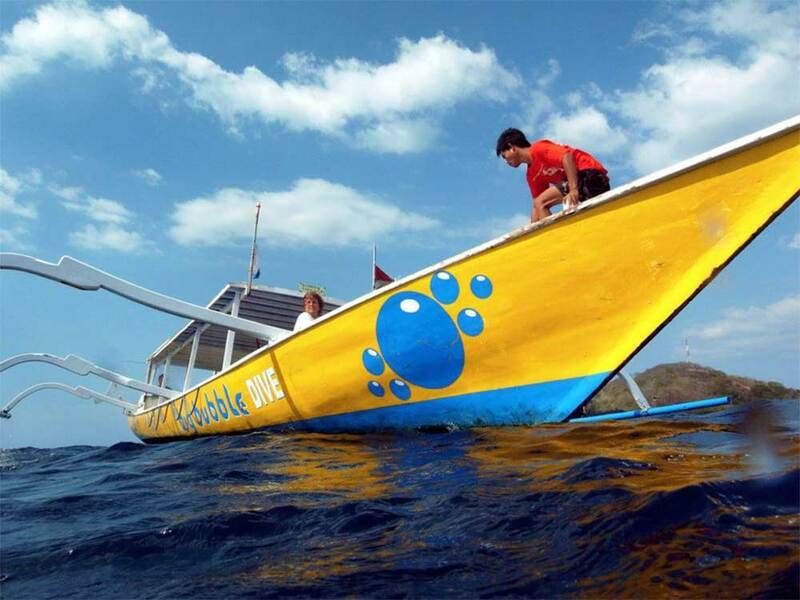 With nearly 15 years experience, Big Bubble are very much one of the first dive centres on Gili Trawangan. Now located at Turtle Beach, which is fast becoming the best part of the island, the dive centre has a lot to offer those looking for fun diving or PADI courses. Everything from the instructors, to rental equipment, pool facilities and accommodation is highly recommended. Big Bubble have recently moved from the loud and busy part of Gili Trawangan to a much quieter beach a little further north. 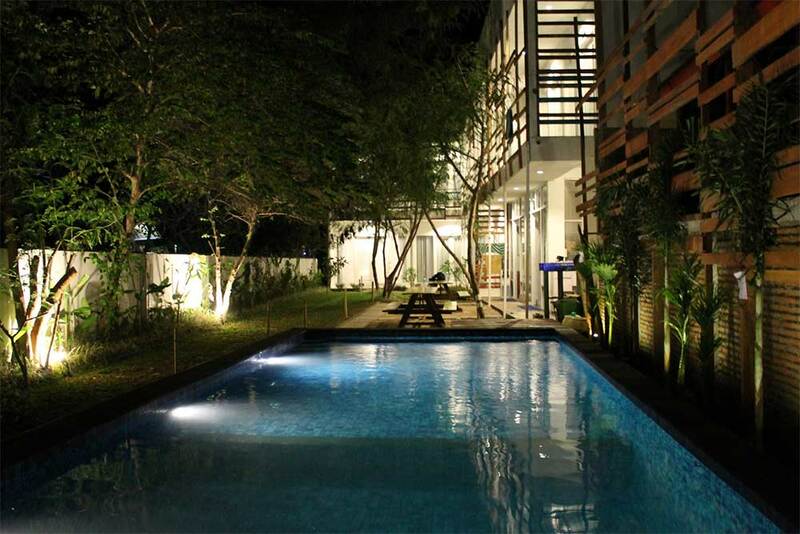 In fact, the location has almost the perfect balance of fun, amenities, and peace & quiet. It is a small to mid-size dive PADI 5-Star dive centre away from the crowds and noise of the market square and bar areas. Here, accommodation is better value and more peaceful. In addition, Big Bubble is set back a few metres from the beach road which goes all around Gili Trawangan. Therefore, although not the easiest dive centre to find or notice, students learning in the pool can do so without being watched by the public, and the office and guest rooms benefit from more privacy and peace, but are still right on Gili Trawangan’s best beach for sunbathing and snorkelling. 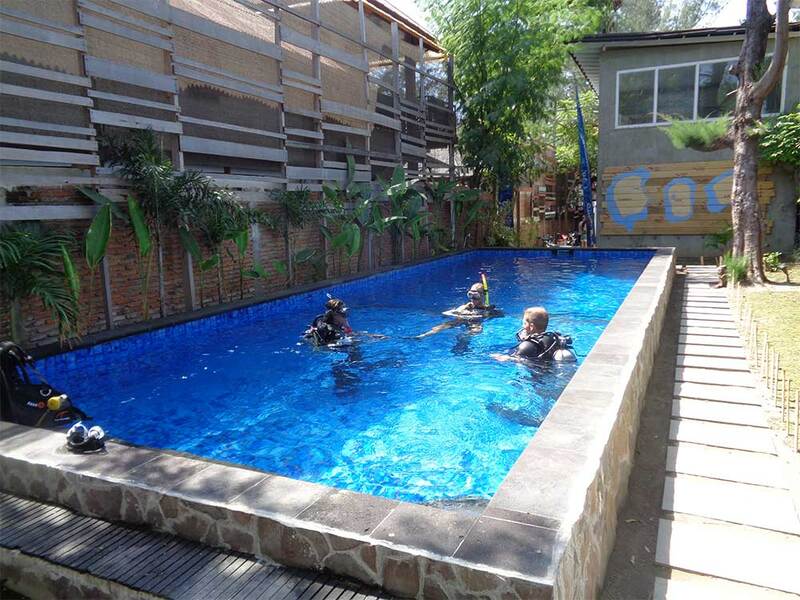 The owners of Big Bubble are English, and have a huge amount of experience with the day-to-day managing of a dive centre in Indonesia as well as providing high-quality fun diving and PADI courses. The diving instructors and Divemasters speak a wide range of languages, and focus on safety and professionalism as much as fun and enjoyment. At Big Bubble there is lots of space both inside and out for guests to relax and socialize as well as read the theory sections of the PADI courses on offer and take part in tests without distraction. The main building is set back farther from the road, behind the purpose-built pool, which is large enough for several groups of divers to learn and practise skills. 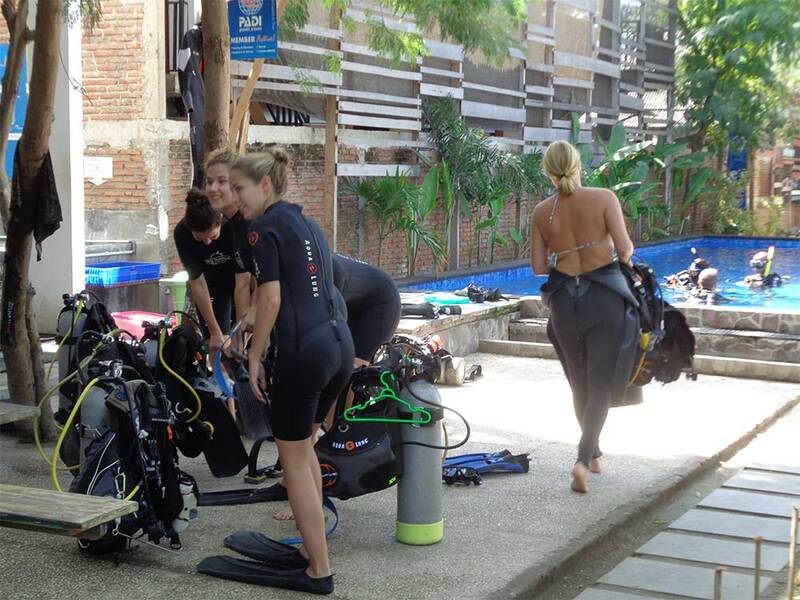 Groups of fun divers and those taking part in courses at Big Bubble are always small, ensuring the maximum safety and personal service. The dive centre is part of the DeJavu Resort, which offers clean and comfortable accommodation, with lots of amenities and a great location at excellent rates. However, diving customers come from all over the island to take advantage of the great service and facilities. Finally, unlike many other dive centres on Gili Trawangan, Big Bubble are only affiliated with PADI for all diving course certifications. For the best balance of location, service and PADI professionals on Gili Trawangan, Big Bubble dive centre is hard to beat. For divers who want to stay at the same location as Big Bubble, there is a small hotel with free wifi, air-conditioned rooms which all have private bathrooms and use of the swimming pool. The hotel was new in 2014, so it's clean and modern. The location is ideal for beachlovers, as it's at Turtle Beach, regarded by many as the best snorkelling and sunbathing beach on Gili Trawangan. Also it's set back a little from the road, making it more peaceful. 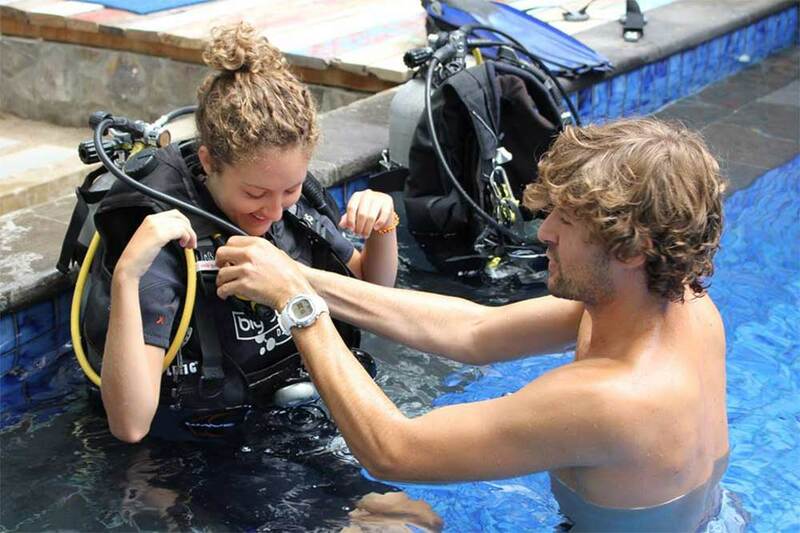 There is a full range of PADI diving courses available at Big Bubble. These include the very first breaths underwater for adults or children and go right up to becoming a PADI professional diver. Skills are taught in the safety of the shallow end of Big Bubble's pool, before going into deeper water, then the sea. The most popular courses taught at Big Bubbles are the PADI Open Water course, Advanced Open Water, EFR, Rescue and Divemaster. But the range is not limited to these. Introductory dives, known as 'Discover Scuba Diving' are available every day, and there are lots of speciality courses, as well. Please contact us for details if you can't find what you're looking for on this page. Due to its fantastic location, Big Bubble guests normally find their own way to the dive centre and/or hotel. A 10-minute walk north from the main pier will bring you to the turtle sanctuary, which is directly opposite Big Bubble's walkway. However, the travel-weary, elderly, lazy or others can ask us to arrange for a horse-drawn cart, known locally as a Chimodo, to transport them to Big Bubble. For guests arriving by private speedboat, the turtle sanctuary at Turtle Beach is the best place to moor. All divers at the Gili Islands are required to pay a one-off fee of 50,000 IDR (less than $4US) to contribute to the local conservation efforts in protecting the beaches & reefs. This 'Gili Eco Tax' payment is valid for all dives by that person for 6 months from the date of payment.